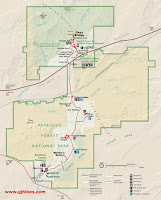 The Giant Logs trail is located in the Petrified Forest National Park near Holbrook, Arizona. The Petrified Forest is laid out so that visitors can drive through the park from either the north or south entrance and exit at the opposite end of the park. The park hours vary throughout the year so that the road is basically only open during daylight hours. To control the theft of park resources vehicles are searched upon exiting the park. There are many places outside the park where petrified wood can be purchased legally for the average price of around $2/pound. To simplify things it is probably best to make purchases after visiting the park. The Giant Logs trail begins at the back entrance of the Rainbow Forest Museum. The trail splits in 3 directions right from the start. The trail to the right loops around the perimeter of the area with another trail that travels through the center section. While the trail is paved there are numerous places where there are steps that would prevent a wheelchair from going. The lower sections of the trail would be somewhat accessible though. There are many fine specimens of petrified wood within close proximity of the trail. It is interesting to note that not all petrified wood looks the same. The trees that became petrified were buried quickly and the oxygen was cut off before they had the chance to decompose. Water with dissolved minerals entered the cells of the wood and took on the exact shape of each cell. The organic matter later disappeared after the minerals in the cells solidified. What was left is a rock that looks exactly like the original tree. The different colors come from the minerals that were present in the water. Manganese makes an darker colors like blue, black and purple; iron makes a yellow, orange or red color, carbon makes a black color whereas copper would tend to make the rock blue or green. The lack of minerals would leave quartz in its naturally clear appearance with tan or gray coming from small amounts of impurities. Various other minerals can also be the source of some of these same colors or variations thereof. Some of the petrified trees are laying on top of the ground almost intact showing the great length of the large trunks. Tree rings and knot holes where branches once grew appear in great detail. The branches, leaves and the smaller sections of the trunk near the top of the trees would have contained softer wood that rotted away before the cells had a time to fill with minerals and petrify. The massive base of this tree, affectionately known as Old Faithful, is over 6 feet high. Measuring about 35 feet in length it is estimated to weigh about 44 tons. It does, indeed, look like a giant log. If you enter the park from the south the Rainbow Museum and Giant Logs trail would be the first stop after the entrance station. People that travel through the park and pass through the south entrance first are probably traveling east on Interstate 40 and following the signs leading to the Petrified Forest near Holbrook, Arizona. 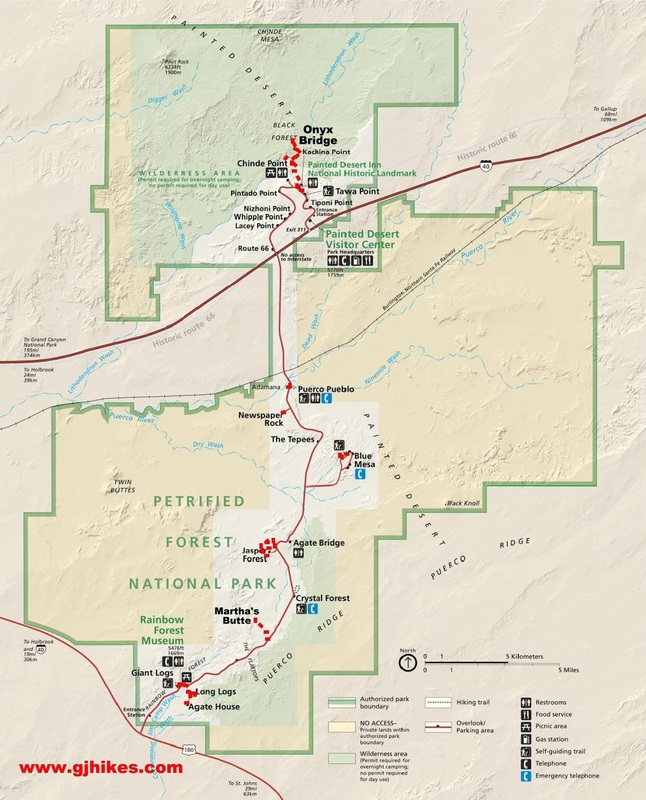 Visitors that come through the north entrance are probably traveling west on Interstate 40 and following the signs at the Painted Desert exit. Regardless of your direction of travel be sure to save some time for the Rainbow Museum and Giant Logs trail. If you would like to see it for yourself then all you have to do is 'Take a hike'.